The Fertiliser Association is a long-term supporter of PhD projects on fertiliser issues. Not only is the Fertiliser Association interested in developing new science and information to take the primary industry forward, we recognise the importance of supporting and increasing the skills and knowledge base of our agricultural science disciplines. Nilusha is undertaking research that could prove a game-changer for managing cadmium concentration in New Zealand soils. Gere is pioneering research in an aspect of soil health that has largely been ignored until now – fluorine’s impact on nitrogen-fixing bacteria. 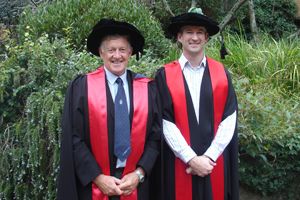 Aaron (right) with his supervisor Professor Mike Hedley. Aaron’s research shows a variation in the plant cadmium uptake of forage species. Daniel has hit upon the ideal formula for applying lime to increase phosphorus availability.